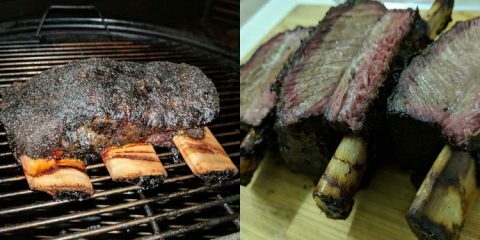 In a world where grills come with more gadgets and technology than my car, the Char-Broil Classic is refreshing return to the basics. 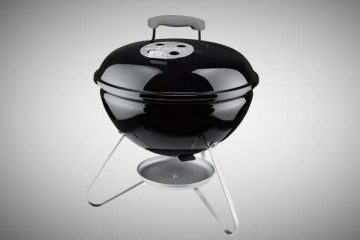 And while it doesn’t have as many bells and whistles as some of the higher end gas grills we have reviewed, it’s sturdy design, excellent burners and 5 year warranty more than make up for any features it might lack. And all at a much lower price point. Should You Buy the Char-Broil Classic 405 4-Burner Gas Grill? Perhaps one of the best features of the Char-Broil Classic 4-Burner Gas Grill is its price tag. Let’s be upfront to begin with, this grill is priced to sell, and sell they do – making it a vastly popular model in the Classic series. The Classic 405 has a few useful extras and a construction that is relatively rust resistant. 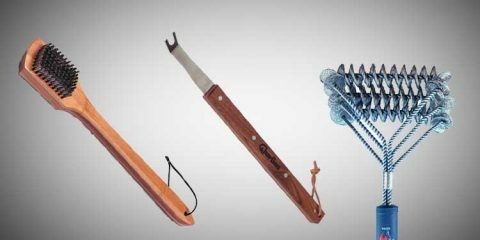 It simply has everything that you would need for grilling, with none of the gimmicks. With 405 square inches of cooking space and four burners putting out 32,000 BTU’s of heat, the Char-Broil Classic 405 can easily meet the needs of a large family or a cookout. The grill grates are porcelain coated and measure 29-inches wide x 14-inches deep, meaning you can easily grill around eighteen burgers at a time. There is a 190 square inch porcelain-coated warming rack that is especially great for warming buns or side dishes, and the Piezo ignition system assures a fast and easy startup. 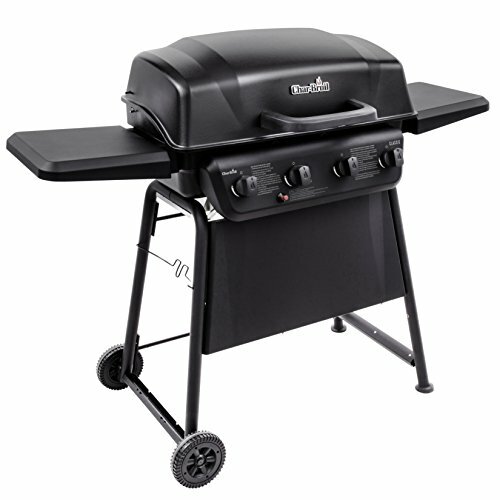 The Char-Broil Classic 405 fully assembled measures 54.3-inches wide x 24.1-inches deep x 43.5-inches high and sits on two wheels for increased portability. Side shelves measure 2-inches W x 13.5-inches deep and provide ample space for food prep. Accessory hooks and side burners can be added but have to be purchased separately. Price – Like we said, the price is one of the Char-Broil Classic 405’s best features. It’s a powerful enough model that it can cater to small or large parties, so for the price, it can’t be beat. Size and Portability – Since you can cook nearly twenty burgers at a time, the Classic 405 definitely has its size working in its favor. It is also lightweight, weighing only 50 pounds, and its two six-inch-wheels make it easy to transport around your backyard or patio. Side Tables – We appreciate the ample space provided by the Char-Broil Classic’s side tables and found them convenient for food prep or resting our tools during grilling, since accessory hooks don’t come standard on this model. If you are limited on space though, be aware that they do not fold down. Withstands the Elements – The lid and control panel are porcelain coated steel, meaning they are built to withstand rust from weathering the elements. However, we do still recommend purchasing a grill cover to make it last a little longer. Difficult Assembly – Assembly can take a bit longer than you would like, and we’ve heard of some people having trouble with parts that need a lot a little “persuasion” to fit together. 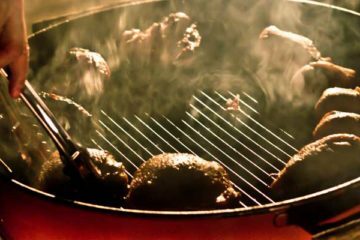 Uneven Cooking – There is a control for each of the four burners, but only food moved closer to the center of the grill cooked evenly. This just means you have to keep a careful eye on your food and get used to the hot zones. Accessory hooks don’t come standard like with most other gas grills, and there also isn’t a thermometer or good storage for your propane tank. If you’re looking for a gas grill with all the bells and whistles then this one isn’t it. But we can’t knock it for being basic when that’s what they are aiming for. To be honest, the Char-Broil Classic 405 is a classic example of you get what you pay for. While it may not be the best grill on the market in regards to build quality, you’re still getting a pretty great value for the price. The porcelain coated heat shield keeps the heat focused on your food. They’re also rust resistant to last you several years. The same porcelain coating can also be found on the cooking grates, helping to protect against rust, prevent food from sticking, and make them easy to clean. The metal side shelves give sufficient space for food preparation or for storing your tools since accessory hooks for tools aren’t included. Assembly of the Char-Broil Classic 405 left a little to be desired. Instructions were unclear, and several parts were bent, barely fit, or had to be hammered into place. Not what you’d like to encounter for what should be an easy assembly, but then again, you get what you pay for. Assembly took us over two hours total and was especially frustrating due to shoddy workmanship. This video does a good job of showing how to setup the grill (note this is for the 2 burner model). While some aspects like the porcelain coated steel lid and control panel may help this grill last for awhile, the overall build quality doesn’t quite measure up to some of the more premium (like Weber) gas grill models on the market. It might be worthwhile to look into the additional accessories that you can purchase separately such as tool hooks and a side burner. 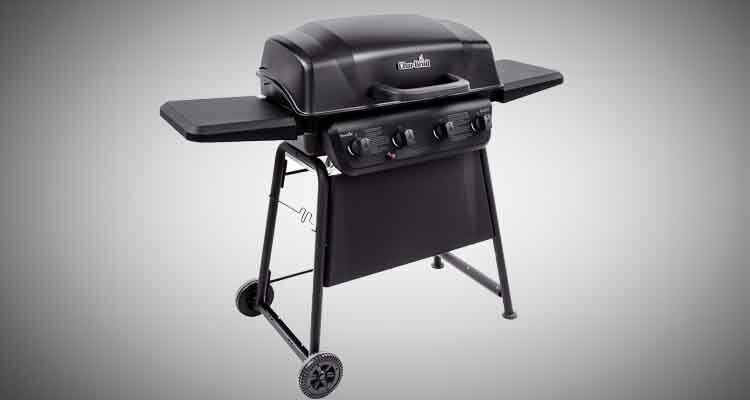 Once assembled, The Char-Broil Classic 405 is easily portable with good maneuverability. The Piezo ignition system is meant for fast and reliable startup of the four burners. With the push of a button, you’re ready to grill. The burners are capable of putting out an excellent amount of heat, 32,000 BTU’s. You have a little bit of control over the heating elements using the controls on the front panel, but we wish these were just a bit more finely tuned for more even cooking. We found that there were some overcooking issues when food was positioned around the sides of the grill. The swing-away warming rack was a great feature in this model and was ideal for toasting buns or warming vegetables. Cleanup is fairly simple. 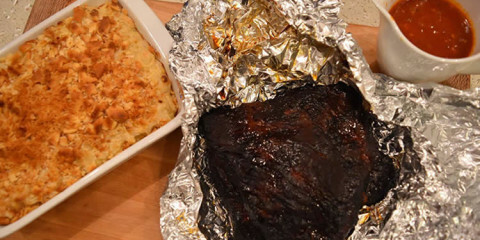 The porcelain coated cooking grates prevent food from sticking, a welcome relief when you are cooking for large parties, and cleaning them was relatively easy. The grease collects in a cup below the firebox, and can easily be removed and emptied, making cleanup quick and easy. 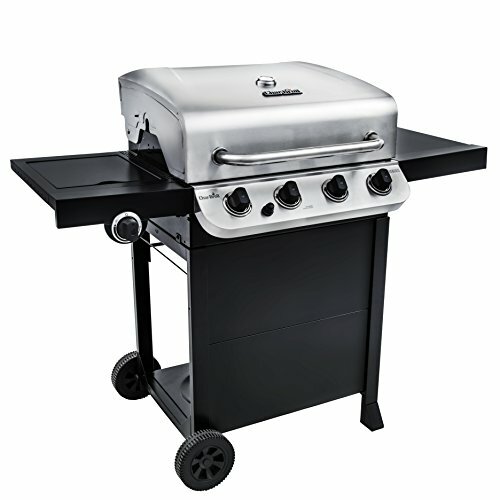 The main competition to this model is the Char-Broil Performance 475 4-Burner Gas Grill. A step up from the Char-Broil Classic 405 model is the Char-Broil Performance 475. Not much separates them in terms of price, as the Performance 475 is just a few dollars more. They are both four burner designs that put out a significant amount of heat. They also both feature ample prep space with their side tables and have a removable grease pan for easy cleanup. The cooking space measures 475 square inches with an additional 175 square inch swing-away warming rack. The electronic ignition is a definite upgrade from the Classic 405’s Piezo ignition system. The lid mounted temperature gauge is also a welcome addition to the Performance 475 model. Again it should be mentioned that you get what you pay for with these grills, and even though the Performance 475 is a step up from the Classic 405, you’re still looking at a product that won’t last a lifetime to be sure. If you’re budget can stretch a bit you should also consider the Weber Spirit II line, especially the E310. 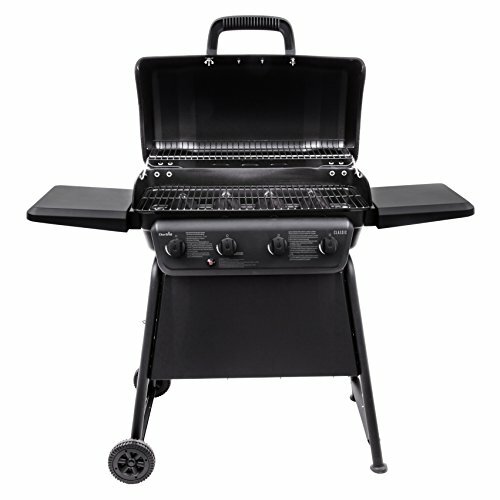 The Char-Broil Classic 405 4 Burner Gas Grill has all the features you need for a great cookout. Its design is simple and doesn’t feature a lot of frills or extra accessories, but it has a sufficient amount of prep space and cooking area. It’s fairly powerful for its size, and its portability is definitely a plus. If you’re looking for a decent grill for a small budget, the Classic 405 hits the mark, but if you can spare the extra few dollars, we encourage you to consider stepping up to the Performance 475. The electronic ignition system alone is worth the difference. Consider your cooking needs, and you can decide which grill suits you best.